Mason came home from school today telling me that he wants to raise money for leukemia. His school is hosting Pennies for Patients for the Leukemia and Lymphoma Society. Mason knows that some of our closest friends have been affected by leukemia; one of my best friends has CML and several of our friends' kids have had different types of leukemia. Having Down syndrome increases the risk of leukemia, so this is something that is pretty near and dear to our hearts. Mason is bound and determined to raise the most money in his school for leukemia ... and hopefully get a pizza party for his class. I told him that I would help him set up a fundraiser here on my blog ... but that he needed to be the one to ask for help. So without further ado, I had the mike over to Mason. THERE IS A GIRL WITH LEUKEMIA NAMED GABY. I NEED TO RAISE MONEY. SHE IS 10 YEARS OLD. SHE GOT IT IN AUGUST 2007. LEUKEMIA IS WHEN SOMETHING RONG WITH YOUR BLOD. ME AND MY SISTER NEED HELP. WE NEED TO COLLECT AS MUCH MONEY AS WE CAN TO HELP. ANY AMNT IS WELCOME. MY GOAL IS TO GET 300 DOLERS FOR EACH OF US. To donate... simply click on the chip in widget or paypal direct to bethanybalsis@mac.com ... thank you for helping Mason's goal come true! *Edited 3/10/12 - the first chipin expired, so we created a second one for the remainder of his goal. Thank you! My sister had lymphom. We are In! What do we do? Do we PayPal you or is there a way to donate on the lls site that would count towards his goal? Aww thank you Lexi! There is a chip in here on the post ... or if you are mobile, just paypal to bethanybalsis@mac.com and I will put it in his pot. :) Thank you so much! Happy to support you, Bubs! 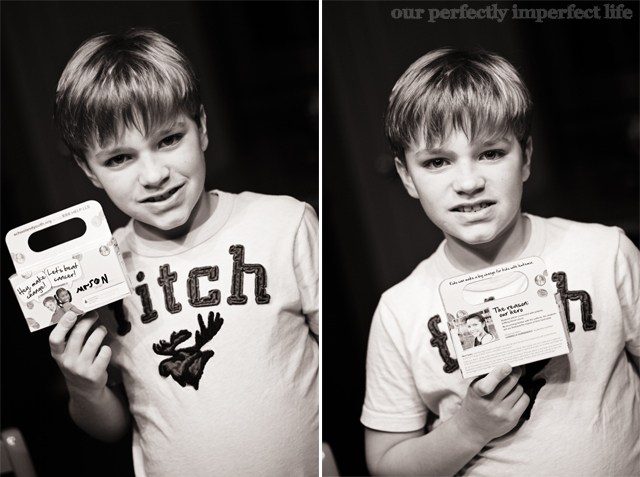 Ethan participated in PFP a few years ago and was also chosen as an Honored Hero through the LLS for the NC chapter. Proud of you, Mason. Ethan sends his thanks, too! I just found your blog. What beautiful children you have, inside and out. My baby girl with Ds will be one in April. I loved reading your blog because it gave me some insight into my future. I love how you are pushing for inclusion with your daughter. I wish they would have done that growing up as well and I would have been better prepared of what to expect. I'm loving everyday, and you seem to be too. Eat our cookies, and donate the money! Seriously! !